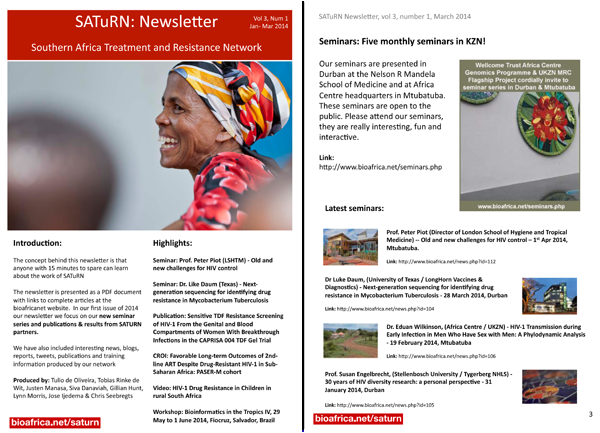 KRISP News: SATuRN Newsletter, Mar 2014: News, publications, videos & new seminar series! SATuRN Newsletter, Mar 2014: News, publications, videos & new seminar series! The newsletter idea is that anyone with 15 minutes to spare can learn about our work and its application in everyday life. In our first issue of 2014 (Vol. 3 Num. 1) our newsletter we focus on our new seminar series and publications and results from SATuRN partners. We also included interesting news, blogs, reports, tweets and training information produced by our network. Publication: Southern African Treatment Resistance Network (SATuRN) RegaDB HIV drug resistance and clinical management database: supporting patient management, surveillance and research in southern Africa.